I knocked on the Oreana rancher's door. 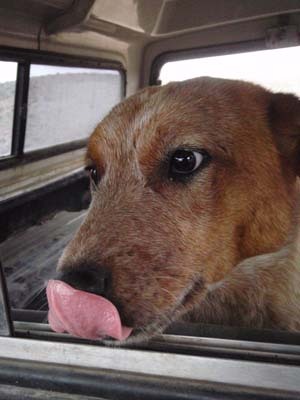 "You missing a red cow dog?" Connie and Karen and I had ridden out towards Brown's Creek to pull ribbons from day 1 of the Owyhee Fandango. Out a couple of miles, we saw a coyote sitting by a water trough, watching us approach. He didn't move as we got closer. "That's not a coyote, that's a dog!" As we got closer we got, the dog slipped behind the water trough and peeked over at us, as if he wasn't quite sure if he was going to get in trouble or not. A dog out here in the middle of nowhere! He had to be a rancher's cow dog, seeing as he wasn't afraid of the horses, and seeing he looked like he was pretty sure he was supposed to be waiting at the water tank. But he was a long way from Oreana, and I didn't see any fresh signs of cows anywhere in the area. Connie, who always has a goodie bag with her, tossed him some pieces of turkey jerky, and he gobbled them up. We turned to continue on out the trail, and the dog stayed by the water tank. Over three hours later we returned via the same trail and water tank, and Cowdog was still sitting there at the water tank, doggedly patient. Connie tossed him some more jerky; I got off to pet him and he wagged his tail; but he wouldn't follow us toward home when we told him to come with us. Cowdog was going to wait at that water tank, because he was sure somebody was going to come get him. "I'll come get you Cowdog," I said, and an hour later I was bumping up the ranch road in my truck to fetch the dog. There were tire tracks on the road, but they were at least a day old, so the young dog had spent at least one night out there. Sure enough, when I drove up, he was still resolutely waiting by the water tank. When I stopped and got out and called him, he still wasn't sure he was supposed to leave the tank, but the bowl of dog food I brought along brought him running. He SCARFED half of it before I could pull it away. I put the rest of the bowl of food in the back of my truck and helped him jump in, and he devoured the rest of it. "Hang on Cowdog, we'll find your home." We putted our way back down the road the couple of miles to Bates Creek, then drove on toward Oreana. I drove up to Rancher Rohl's house because I knew they ran cattle up in the mountains up that road, and I figured at the least, they'd know who the dog belonged to. I knocked on their door. "You missing a red cow dog?" Missing him they were - "Clifford!" They'd run some cattle up there the day before, and Clifford must have gotten lost, or fallen off the cattle truck, or run off after something besides cows. I let Clifford out the back of my truck, he ran in his yard, got petted, sniffed the yard dog, looked at me as I drove off. Smart dog. 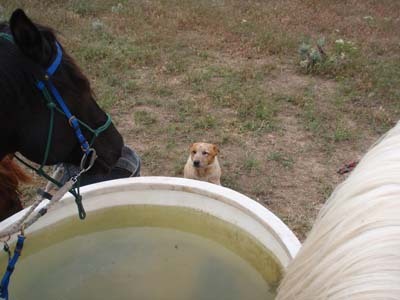 He knew somebody would come pick him up if he waited long enough at that water trough.